The Palestinian Prisoners’ Society (PPS) has reported that Israeli soldiers abducted, on Tuesday at dawn, at least thirty Palestinians, including several children, during massive invasions and searches of homes, in different parts of the occupied West Bank. The PPS office in Nablus, in the northern part of the West Bank, has reported that dozens of soldiers invaded Balata refugee camp, east of Nablus, and Nablus city, searched and ransacked many homes, causing excessive property damage, and abducted ten Palestinians. It identified the abducted as, Aseed Khaled Reehan (a student of the Najah University in Nablus), Soheib Hamad, Ahmad Saheli, Safwat al-‘Aasi, Odai Oweiss, Eyad Hashshash, Ismael Marshoud, Mohammad Ata Maseemi, in addition to two former political prisoners identified as Nimir Khaled al-Hindi (a student of the Najah University in Nablus), and Mohammad Sharay’a (abducted by undercover soldiers). 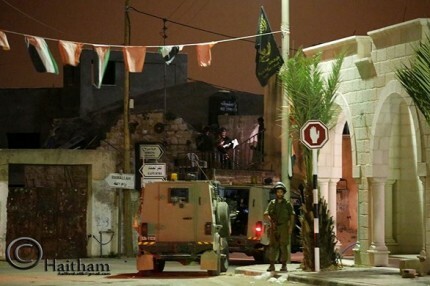 Furthermore, many army vehicles invaded Beit Fajjar town, south of Bethlehem, before the soldiers stormed and violently searched many homes and abducted seven Palestinians. The Bethlehem office of the PPS identified the abducted Palestinians as Ahmad Mahmoud Taqatqa, 16, Mohammad Waleed Thawabta, Ahmad Jihad Thawabta, Nour Nasr Thawabta, 16, Osama Abdul-Fattah Thawabta, 14, Khaled Mohammad Taqatqa, 15, and Bilal Shaher Sabarna, 15. Also in Bethlehem, the soldiers invaded and searched homes in ‘Aida refugee camp, north of the city, and abducted Ahmad Mohammad Jado, while one Palestinian, identified as Ibrahim Yousef Faqeeh, was abducted from his home in Marah Rabah village. Furthermore, the soldiers invaded Silwad town, east of Ramallah, searched homes and abducted five Palestinians, identified as ‘Awni Fares, Mohammad Abdul-Nasser Hamed, Jihad Hamed, Ayman Mer’ey Hamed and Khalil Mer’ey Hamed. In Qalqilia, in the northern part of the West Bank, the soldiers abducted two Palestinians, identified as Anas Hamad and Haitham Hassanein. One Palestinian, identified as Mohammad Amarna, was abducted from his home in Ya’bad town, southwest of the northern West Bank city of Jenin. It is worth mentioning that the Israeli army said in a statement that the soldiers have arrested thirty-four Palestinians in different parts of the West Bank.